Our product range includes a wide range of graveloc coupler. We have established ourselves as reliable manufacturers for high performing Graveloc Coupler. 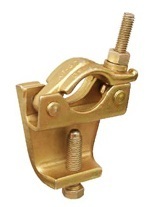 These couplers are one of the best selling clamps that are widely demanded to fasten scaffold tubes to beams requiring a specialized fitting. Developed from premium grade sheet metal, the offered couplers feature 21mm nuts with mild steel hex bolts of 5/8" x 76mm size. Further, we are providing this heavy duty coupler in durable zinc plated finish at a competitive price.